To read the online version of our November 22-28 HaLuach, please click here. Perform another Mitzvah on Maccabee Mitzvah Day - Donate to CTS! On Maccabee Mitzvah Day at CBS, bring donation items to Beth Sholom for the Community Thrift Shop. Declutter your home and perform a mitzvah at once! Donations will be accepted on December 9 from 12:30-2:30 p.m. Items should be clean and in good condition. Not sure about your item? For larger items that need to be picked up, call CTS directly at 415.861.4910. On Maccabee Mitzvah Day, volunteers will doyou the mitzvah of delivering your items to CTS! However if you wish to take the tax deduction for your donation, please deliver your items directly to CTS. Make sure to have your donations credited to Beth Sholom! If you are available to help with collections on Mitzvah Day, or you have a van or station wagon that we could use to deliver our goods to CTS, please contact Kelsey Russom. Did you miss Achshav Yisrael’s November presentation? Read about it here! Join us on Sunday, December 9 in a communal volunteer effort to rededicate and beautify our sacred temple. We'll have the opportunity for hands-on beautification and restoration followed by a festive Hanukkah celebration. Let's be the light and shine the light on our spiritual home...together we can perform the mitzvah of elevating our incredible space. This event is FREE & Open to All. There are a range of projects to undertake that day. You can choose the project that you prefer and you'll work in a small team with a house committee member. Please read more about the projects below and then register for the team in which you would like to contribute. A festive celebration including: Candle Lighting, Food & Drink, Games, Dramatic & Musical Performances & More! We’ll work on the Zweifach Meditation Garden, the Eva Gunther Plaza deck and wall planters, and a few other small projects. In the long term, we’d like to form a gardening committee to manage these spaces on a regular basis, so please contact Allen if you are interested in that. We have a collection of art and memorabilia that needs to be hung on various walls. We have chosen the locations. We'll be hanging a temporary exhibition in the Chapel Gallery, and permanent installation, on drywall or concrete, of other art items. Those of you who are long term congregants will remember the metal sculptures depicting the 12 tribes that used to hang above the bimah in the old sanctuary. These are going to be mounted on the concrete wall above the reception desk in the lobby. As each tribe is in at least three pieces, need to be mounted directly to the wall, and need to align precisely with each other when hung, persons with carpentry experience would be welcome for this task. The Tree of Life memorial wall is being moved from the Library to Koret Hall. We need some strong folks to help with the moving and installation. Working with Beth, this team will be inventorying items we have in our various storage spaces, moving stuff around to better locations, and discarding things that have passed their sell-by date. We also may power-wash the EG Plaza deck and walls, exterior stairwells, and other places as needed. This team will wash, vacuum, assess, refinish and move as necessary the pews in the Gronowski Chapel and Makom Shalom. There may be additional light carpentry tasks for this team as well. Additional work: There is always something to do around the shul! We have some electrical work to do, replacing ballasts and fixtures. There is some repair work to do, such as replacing door handles. There may also be some other technical work related to building systems such as phones, computers, HVAC, A/V, security and so forth. If you have expertise in these areas and would like to join our team of handypersons, please contact Mark Gunther or David Madfes. And, of course, there is always the much appreciated ongoing option to donate gelt towards these efforts. Long-time CBS congregant, Jerry Neuhaus, was featured in a great article in The New Fillmore, a local paper that covers one of San Francisco’s most vibrant neighborhoods. The article, written by Howard Freedman, covers Jerry's life story: from his birth in Spangenberg, Germany, to his immigration to the U.S. in 1937 (bringing along a sacred Torah scroll), and the establishment of the Neuhaus Brothers clothing store, which played such an important role in the development of San Francisco's Fillmore District. To read the online version of our November 8-14 HaLuach, please click here. As the weather gets colder and you return to your closet to get out your winter coat, you may find it no longer fits. Shabbat School has organized a warm coat drive with the “One Warm Coat” organization. Please bring your gently used coats and help warm those in need. Jackets, coats, warm sweaters, etc. we will take them! Did you know that nearly 15% of Americans are living in poverty and struggling to provide warm coats for themselves and their families? This year we’re teaming up with One Warm Coat to hold a coat drive and we need your help! Donate coats to our drive! From now until December 17 stop by the CBS office to drop off gently worn coats. All coats collected will be donated locally to our neighbors in need. Our goal is to collect 200 coats! Get all of the details here. Donate dollars! Donations to One Warm Coat support their coat drive program and outreach efforts. Every $5 donated warms 10 people - what an incredible impact! You can donate directly to our coat drive and help us reach our goal by clicking here. You can also donate by cash or check during our coat drive. Cash and check can be dropped in the small box on Rebecca's desk in the main office. We hope you will support our coat drive and help us warm our neighbors in need. You can learn more about One Warm Coat by visiting their website: https://www.onewarmcoat.org. Thank you for your consideration! If you have any questions, please don't hesitate to contact Rebecca. 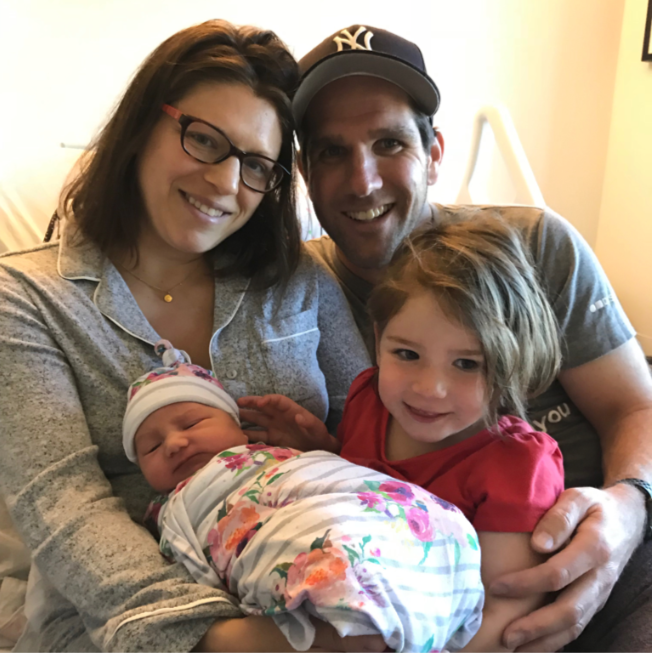 Mazel Tov to Katherine and Gerard Barboni on the birth of their second daughter! Isabella Grace Barboni was born on Friday, November 2, 2018 (24 Cheshvan, 5779). She weighed 7 pounds, 6 ounces and was 20 inches long. Katherine, Gerard, Claire and Isabella are doing well, and Katherine is looking forward to visiting everyone at CBS. The CBS community welcomes Isabella with love and open hearts! Bennett Taubman's Bar Mitzvah on November 10. Mazel tov Bennett!